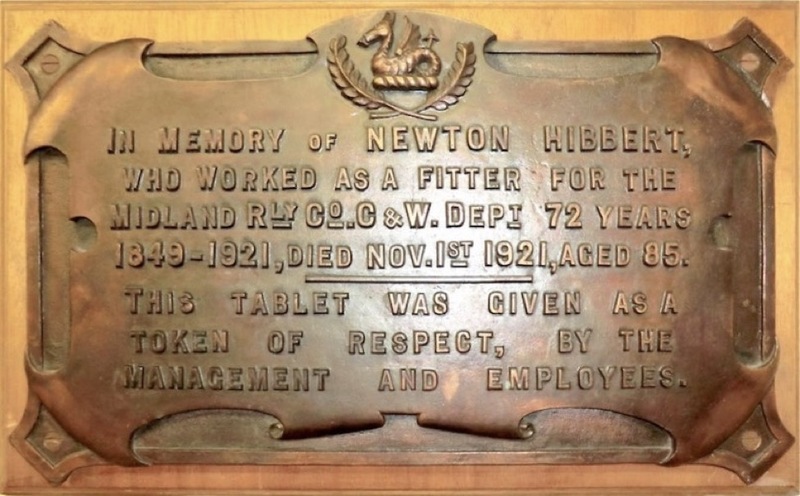 Take a few moments to read and consider the bronze plaque "In Memory of Newton HIBBERT". Think about what it means to work for one company for 72 years. Think what his death meant to his workmates to cause them to commission this plaque. Newton HIBBERT was born in Derby, anywhere between 1836 – 1841, depending on which record is consulted. His father was also Newton HIBBERT who originated from Twyford, Derbyshire. Newton Jnr. was the eldest of six siblings, having three sisters and two brothers. He was brought up in the Lodge Lane area of Derby and briefly worked as a silk mill hand – a very common occupation in the neighbourhood. However, around 1850 when his age was in the region of 13yrs, he obtained a job as a labourer for the Midland Railway at the company's Carriage & Wagon Works in Litchurch Lane. Newton’s first marriage was before 1871 to Mary Ann SULLIVAN, but they appear to have had no children before Mary Ann died in 1878. In 1887 he married again, this time to widow Mary KEYS nee FARRELL, with whom he produced three daughters Harriet (1887/88), Gertrude (1892) and Elizabeth (1894). He also became step-father to Mary's six children. 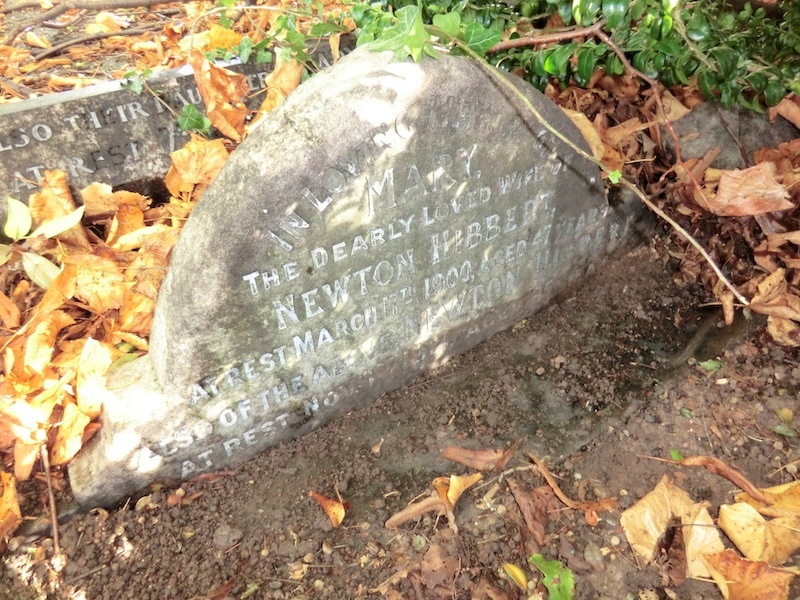 Newton was widowed again on 17th March 1900 when Mary died aged 47. The family home for over 20 years had been on Uttoxeter Old Road, Derby – No. 60, then No.20. Following the marriage of his eldest daughter Harriet, to grocer Robert BIRD, Newton moved in with them at their home of No.21 Haddon Street, Derby. Gertrude became married to Percy HEMMING but Elizabeth remained a spinster. Harriet died on 5th October 1921, aged 34, and presumably due the recent death of her sister, Gertrude was staying at Haddon Street. 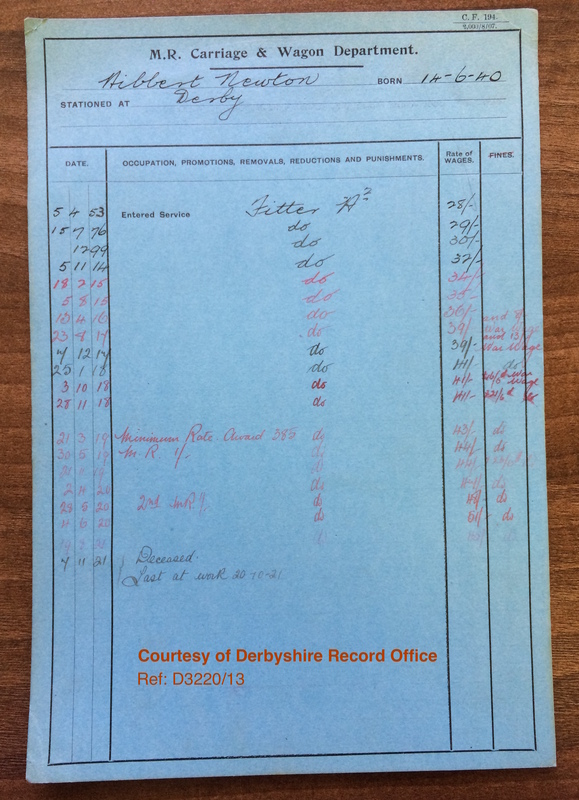 Newton's record card from Litchurch Lane survives in the care of Derbyshire County Record Office (their reference D3220/13) one of several hundreds, if not thousands, of such records they hold. This appears to have been retrospectively created in 1914 and shows him being taken on by the Company on 5th April 1854. It also records his date of birth as being 14th June 1840 which more-or-less accords with later census records - though not the Study Centre plaque. Interestingly, as well as confirming his grade as a fitter throughout his career, this card records his last day at work as being 20th October 1921, confirming he was working right to the end. During the morning of Saturday 22nd October 1921 Newton left Haddon Street intending to get a shave. Later that afternoon, a nurseryman working in gardens called The Glebe, described as being between Porter Road and Whitaker Road, heard a man fall over. On rushing to assist he found Newton face down on the footpath, unconscious. An ambulance was called and, according to the subsequent inquest, he “seemed stupid and dazed, and could give no account of himself.” Evidently his demeanour led to the assumption he was a vagrant and so was taken to the Derby Union Infirmary – the Workhouse – rather than to the town’s main hospital, the Royal Infirmary. Whether this decision had any effect on the final outcome isn't recorded, though the inquest report seems to strongly hint that it did. The doctor who received him at the Union Infirmary, Dr. Jane Reynolds told the Coroner that the patient was evidently suffering the effects of a seizure. In any event, he died ten days later of what was described at the time as “apoplexy”. This now discredited term (at least in describing a cause of death) could cover anything from a heart attack to, perhaps more likely, a stroke. Meanwhile, his daughter, Gertrude, was concerned as to her father’s whereabouts. As he hadn't returned by 10pm, she reported him to the police as missing. He was eventually tracked-down to the Workhouse, although the report of the time doesn't make it clear how long before his subsequent death this was. He died on 1st November 1921 when his age was recorded as 85 . His inquest and funeral took place on the same day, Friday 3rd November. The cause of death was recorded as “natural causes” and he was buried with great ceremony in Derby's Nottingham Road cemetery. The mourners included many workmates from H Shop at the Midland Railway's Carriage & Wagon works. He had worked for the Midland Railway at the Carriage & Wagon works since 1849, a period of uninterrupted service of 72 years. The newspaper report of his funeral said that he was “considered to be one of the oldest railway employees in the kingdom”. The bronze plaque which was bestowed in his honour is now preserved in the Midland Railway Study Centre. and if Newton were unable to perform his job adequately, they would surely cause him to retire. Unfortunately too much time has elapsed to allow us to really find out who Newton HIBBERT was and what lead to him being reputedly "one of the oldest railway employees in the kingdom". One thing is for sure, he must have been a popular man given the "token of respect" of having a bronze tablet erected in his honour. The death of a Derby octogenarian who worked regularly as a fitter at the M.R. 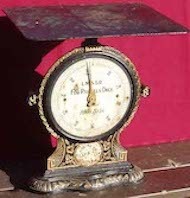 works and had not seen a doctor for years, was the subject of an inquiry conducted by Mr. J. Close (Coroner) and jury at the Police Station this (Friday) morning. The deceased man, Newton Hibbert (85), resided in Haddon-street, and died at the Union Infirmary on Nov.1. Mrs. Gertrude Hemming, daughter of the deceased, with whom he resided, said that her father left home on Saturday morning, Oct 22, for a shave. He was in the best of spirits, not having seen a doctor for several years. He worked regularly. He had never been subject to fits, but had had dizzy bouts. As he had not returned by 10 p.m. she communicated with the police, and was told he had been taken to the Workhouse Infirmary where he died on Nov. 1. Wm. Charrington, nurseryman of 8 Lyndhurst-street, said that on the afternoon of Oct. 22 he was working in the Glebe Gardens, between Porter-road and Whittaker-road, when he heard the sound of somebody falling. Running to the road he found the deceased lying unconscious on the footpath, face downwards. The ambulance was summoned and he was taken to the Union Infirmary. Dr. Jane Reynolds, house surgeon at the Union Infirmary, said that the deceased was in a semi-conscious state on admission, and was evidently suffering from the effects of a seizure. The face was bruised, probably owing to his fall to the ground. Death was due to apoplexy. By the Coroner – Witness had been informed that deceased had first been taken to the Royal Infirmary, but was conveyed to the Union Infirmary as the case was thought to be a suitable one for the latter institution. Deceased seemed stupid and dazed, and could give no account of himself. A verdict of "Death from natural causes" was returned. The funeral of Mr. Newton Hibbert took place at the Nottingham-road cemetery on Friday. The deceased gentleman, who had attained the age of 85 years (having been born in the year 1837), was considered to be one of the oldest railway employees in the kingdom. He commenced work in the Midland Railway Works in the year 1850, at the age of 13 years, and continued at work until the 20th ultimo, thus creating a record of continuous service of between 71 and 72 years with the Midland Railway Company. The internment took place amid manifestations of great regret, a good number of his fellow workers preceding the hearse. The mourners were: Mrs. Hemming, Miss Hibbert, Mrs. J Burgess, Mrs. W J Bates, Mrs. G Smith (daughters), Messrs. P Hemming, R Bird, J Burgess and T Keys (sons-in-law), Miss Bird, Miss Rowbotham, Mr. Gask, Mrs. Smith, and Mrs. Brentnall. The service at the cemetery was conducted by the Rev. W.W. Goldstraw. Among the numerous representatives were Miss Vessey (F Shop), Messrs. A Smith (late foreman), A Gomm and E Kemp (foreman H2 Shop), Messrs. L Eastwood, J Pipes, W Brick, G Thompson (H2 Shop), Messrs. J Clarke and J Mansfield (Tin Shop), Mr. J Hemstock (Trimming Shop), Mr. W Brentnall (Time Office), Mr. Morris (late Correspondence office), Mr. F Youle (D Shop), Mr. Tatler (N Shop), Messrs. H Wood, R Garratt, and N Dunning (H1 Shop), and Mr C Goodwin (engineer, Royal Infirmary). Floral tributes were sent by the relatives and Mr. & Mrs. H Bird; Leonard and Nellie, and Lilly Bird; Mrs. Rowbotham and family; Mr. and Mrs. Wiliams and family; Mr. & Mrs. Hunt and family; Mrs. Waite and family; foremen C&W Works; foremen and workmen, H2 Shop, H Shop Benevolent Fund; foremen and workmen, H1 Shop; F Shop, C&W Works. The coffin was of polished elm, with brass fittings and nameplate, inscribed "Newton Hibbert, at rest Nov. 1, 1921, aged 85 years". It was borne by six of the deceased's workmates from H2 Shop: Messrs. J Mottram, G Lyons, J Boyd, E Brown, WE Luton and G Allsopp. 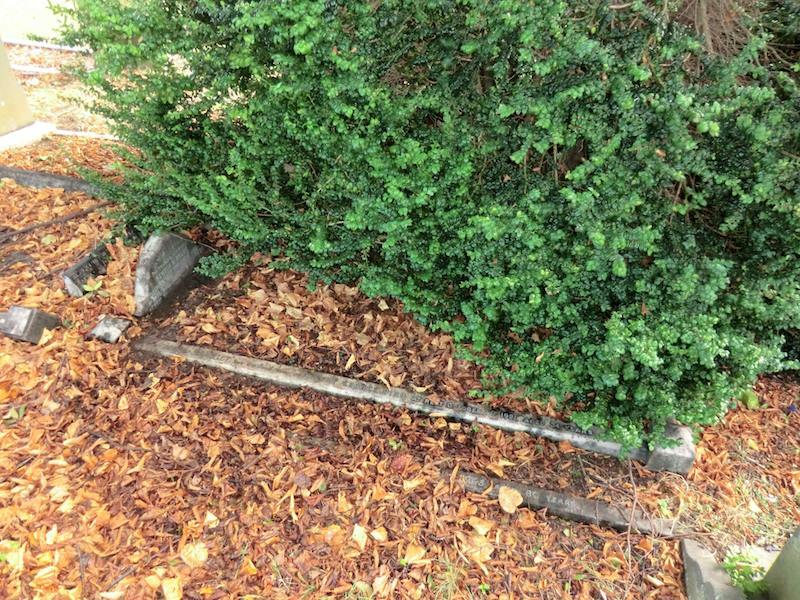 The funeral arrangements were carried out by the Derby and District Funeral Co.
Newton HIBBERT’s sadly neglected grave in Nottingham Road Cemetery, Derby, also contains his second wife, Mary, as well as their daughters Harriet and Elizabeth. The memorial to Mary HIBBERT, with Newton HIBBERT’s memorial below. The memorials for their daughters Harriet and Elizabeth are inscribed along the sides of the grave. Mary KEYS (step) 1875 – ?? – died ?? Florence KEYS (step)1884 – Smith – died?? Gertrude 1892 – Hemming – died ?? BMD – Deaths Q4 1964 Derby 3a 264. Robert G BIRD aged 81 . Emma BATES aged 75 . William KEYS aged 64 . Hannah BURGESS aged 75 . BMD – Deaths Q3 1930 Shardlow 7b 460. Elizabeth HIBBERT aged 36 . BMD – Deaths Q4 1921. HIBBERT, Newton aged 85. 7b 739. Page 78 Record 1167: Newton HIBBERT, fitter, 84yrs, address – Workhouse, Derby. Buried 04NOV1921 by WW Goldstraw, plot 51736. General ground – yes. Memorial: "In loving memory of Mary, the dearly loved wife of Newton HIBBERT, at rest March 17th 1900, aged 47 years.Also of the above Newton HIBBERT at rest Nov 1st 1921 aged 85 years. Also of Harriet, the beloved wife of Robert George Bird, at rest October 5th 1921, aged 34 years. Also of Elizabeth, beloved daughter of the above, who died September 19th 1930, aged 36 years. Death of Harriet BIRD aged 34 . Robert George BIRD of 21 Haddon Street, Derby enlisted in the Royal Regiment of Artillery on 10MAY1916 aged 32yrs 9mths [August 1883]. Service No. 68558. Listed as a married grocer. Harriet HIBBERT married Robert BIRD in Q2 1911. Robert George BIRD born 26AUG1883 in Stafford, son of Henry & Alice BIRD. Christened 09SEP1883. Living at 62 Shaftesbury Crescent in 1901, father is a carriage painter, Robert is a grocer's assistant. 1911 Census - 20 Uttoxeter Old Road, Derby. Newton HIBBERT, head, 72 , Widower, Fitter, Rly Co.'s Carriage Works, born Derby. Harriet HIBBERT, daughter, 24 , single, cotton worker, born Derby. Gertrude HIBBERT, daughter, 19 , single, tailoress, born Derby. Elizabeth HIBBERT, daughter, 17 , single, dressmaker, born Derby. Florence SMITH, 27 , married daughter, married 5 years with one child, housekeeper, born Derby. Florence Gertrude SMITH, grand daughter, 5 , born Derby. BMD – Marriages Q3 1903 Derby 7b 1241. Emma KEYS married William Joseph BATES (b. abt 1875, iron riveter living with parents George, iron moulder, & Marion at 30 Cowley Street in 1901). 1901 Census – 20 Uttoxeter Old Road, Derby. Newton HIBBERT, head, Widower, 60 , engine fitter, born Derby. Emma KEYS, step-daughter, single, 22 , tailor's machinist, born Derby. Florence KEYS, step-daughter, single, 18 , tailor's machinist, born Derby. Harriet HIBBERT, daughter, 14 , born Derby. Gertrude HIBBERT, daughter, 9 , born Derby. BMD – Deaths Q1 1900Derby, 7b 454. Died 17MAR1900, buried Nottingham Road cemetery. BMD – Marriage Q1 1895 Derby 7b 640. Hannah KEYS marries Joseph Henry BURGESS. BMD – Birth Q4 1893 Derby 7b 750. 1891 Census – 60 Uttoxeter Old Road, Derby. Newton HIBBERT, head, married, 50 , engine fitter, born Derby. Mary HIBBERT, wife, married, 38 , born Derby. Hannah KEYS, step-daughter, spinster, 19 , tailoress, born Derby. Thomas KEYS, step-son, single, 17 , general labourer, born Derby. Mary KEYS, step-daughter, 16 , upholsteress, born Derby. Emma KEYS, step-daughter, 12 , general labourer, born Derby. Florence KEYS, step-daughter, 9 , scholar, born Derby. Harriet HIBBERT, daughter, 3 , born Derby. BMD – Marriages Q2 1887 Derby 7b 773. 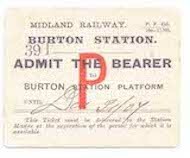 Midland Railway Friendly Society – benefits paid year ending Dec 31st 1882. BMD – Deaths Q1 1882 Derby 7b 325. KEYS, William aged 41 . Thomas MAKEFIELD, head, married, 42 , house pianter, born Derby. Maria MAKEFIELD, wife, married, 41, , born Derby. Newton HIBBERT, boarder, widower, 43 , engine fitter, born Derby. William KEYS, head, married, 39 , foundry labourer, born Derby. Mary KEYS, wife, married, 29 , tailoress, born Derby. Hannah KEYS, daughter, 9 , scholar, born Derby. Thomas KEYS, daughter, 7 , scholar, born Derby. Mary J KEYS, daughter, 6 , scholar, born Derby. Emma KEYS, daughter, 3 , scholar, born Derby. William KEYS, son,1 , born Derby. HIBBERT, Mary Ann aged 38 . 1871 Census – 8 Lodge Lane, Derby. Newton HIBBERT, Lodger, married, 35 , mechanical engineer, born Derby. Mary Ann HIBBERT, wife, married, 34 , born Nottingham. ?? Newton HIBBERT married Mary Ann SULLIVAN ?? KEYS, William & FARRELL, Mary . Martin FARRELL, head, 50 , bricklayer's labourer, born Wexford Ireland. Mary FARRELL, wife, 50  born Kelso Ireland. Mary FARRELL, daughter, 18 , silk mill hand, born Derby. John FARRELL, son, 15 , mill hand, born Derby. Marriage of James MOSLEY, 23  (father Jospeph MOSLEY, frameboard knitter) bachelor of Gisborne Street, Derby to Sarah HIBBERT 23  (father Newton HIBBERT, labourer) of Lodge Lane, Derby. Newton HIBBERT, head, married, 59 , labourer, born Twyford. Harriet HIBBERT, wife, married, 52 , born Norfolk. Newton HIBBERT, son, unmarried, 22 , iron fitter, born Derby. Harriet HIBBERT, daughter, unmarried, 27 , factory hand silk, born Romford. Sarah Ann HIBBERT, daughter, unmarried, 19 , factory hand silk, born Derby. John HIBBERT, son, unmarried,15 , factory hand silk, born Derby. Amelia HIBBERT, daughter, 11 , factory hand silk, born Derby. Frederick HIBBERT, son, 6 , scholar, born Derby. Marriage of William HIBBERT, 21  (father Newton HIBBERT, labourer), bachelor of Lodge Lane, Derby to Louisa WALKER, 20  (father Robert WALKER, porter), spinster of Lodge Lane, Derby. 1851 Census – 19 Lodge Lane, Derby. Newton HIBBERT, head, married, 40 , labourer, born Stenson. Harriet HIBBERT, daughter, unmarried, 17 , silk winder, born Romford Essex. Newton HIBBERT, son, unmarried, 13 , silk winder, born Derby. Sarah HIBBERT, daughter, 6 , scholar, born Derby. Amelia HIBBERT, daughter, 8mths , born Derby. Harriet HIBBERT, wife, 39 , born Norfolk.